The well-placed bells along the highway US 101 that marks the distance in miles to the nearest mission, reminds us of the cultural and historical significance of the El Camino road (The King’s Road). The road that was one of the foremost long distance highways in the state of California also has stories and myths associated with it. 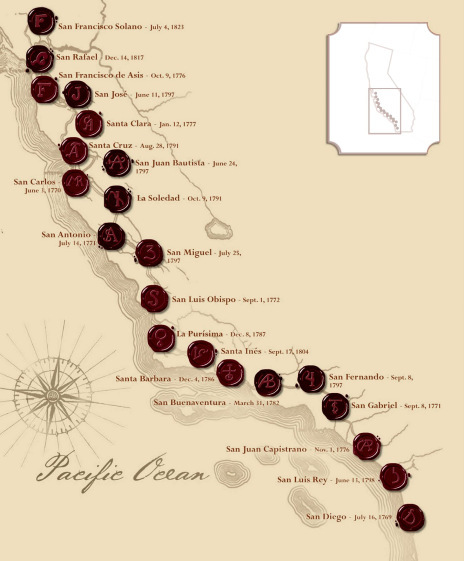 El Camino stretches as long as 600 miles from San Diego in the south to Sonoma in the north, once connected 21 Franciscan missions. It was amongst the state’s first long distance well-paved roads. It was the time when America was fighting with England, there were Spaniards and Mexicans who formed the outposts up to the California coast, the reason was to secure Nueva California and extend New Spain. The earliest mission was near sea ports like San Diego and Monterey Bay and eventually was followed by the conversion of the native; and with this came the establishment of the first mission in 1769 at San Diego with the erection of fortress and a Franciscan mission. A footpath, called The El Camino Real, or Kings Highway, was created to connect the outputs (mission). Each of the outposts was created where the basics for life were easily available- soil, vegetation with a large population of Indians. With the time, more missions were accommodated and the roads widened to give ways to wagons & horses. There were presidios and pueblos- the military fort and Hispanic settlements for Spanish & retired military officials respectively. This highway linked the Spanish settlement to the distant administrative centers. And, even after the missions decline the highway continued to be in use by the Butterfield Stage Coach Company for travel from Texas to San Francisco in the late 19th century. The road’s route had changes path several times due to the weather, tides and mode of travel. Moreover, the importance decreased when the water route (between Southern and Northern California) came as much preferred transportation route than the El Camino highway. There are two theories that contribute to the transformation of the lost glory to the road of travel importance. It was first proposed by Miss Anna Pitcher, Director of the Pasadena Art Exhibition Association to the Women’s Club of Los Angeles in 1892, in order to provide a well-paved highway for the wealthy to travel. The rise of automobiles gave it a new lease of life when the California Department of Transportation, or Caltrans) decided to create a unified system of the highway for the automobiles. The Caltrans were given the responsibility to pave the way from the northern end of San Mateo County down into San Jose and with the construction of motels, restaurants and the buildings of commercial importance, the road gained its lost glory. Second Interpretation: The Spanish dominated California was made to be seen as a romantic paradise and this was backed heavily by the 1884 publication of Helen Hunt Jackson’s “Ramona”. People saw California’s mission as the place where tourists could commune with the past comfortably. And to fuel this they cooked up the story of Franciscan fathers travelling from mission to mission while staying at each place for a day or so. Matthew Roth of the Automobile Club of Southern California Archives says that the road was more or less not a continuous path and people had created many stories to attract the tourists and settlers. The activist Harrie Forbes and groups like Auto club, Native daughters of the golden west and the California federation of woman’s club came together to reclaim the El Camino highway into a tourist highway in the early twentieth century. 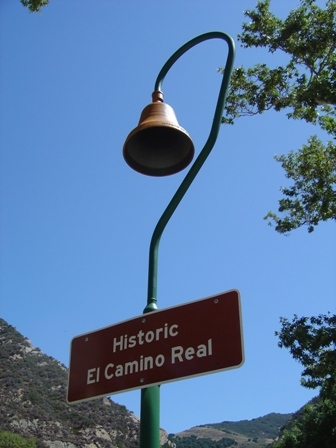 The association placed around 400 roadside markers in the form of “cast iron bell” from 1906-1914 that hung from a shepherd’s staff looking pole along the original footpath to assure that the bikers were travelling on the El Camino real. The bell marked the distance in miles to the nearest mission. Although in 1910 State Highways Act authorized construction of a paved road along the route of El Camino Real, nothing could be materialised and for many years the road just stayed in the primitive trail and by 1925 much of its route was labelled as US 101(the longest highway in California that is still in use) and the limited access freeway construction began in 1960 on highway US101. The road was in use for people travelling between San Jose and San Francisco, but now it was not a state-wide travelling rather it had become a road for business travellers, shopping centres, offices etc. Today the historic road is more of a short distance travel than the long state-wide travel. The cast iron bells have been replaced at many places by the Caltrans recently along the San Diego to San Francisco because of the vandalism and theft. The communities today are making efforts to make the road more pedestrian-friendly along with making a place for buses and cycles and endeavouring aesthetic makeover. The highway is evolving to accommodate the retail and commercial alignments to cater the needs of the nearby residential dwellings. The El Camino (The Royal Road OR The King’s Highway) continues to show the path to the motorists while the mystery surrounding the truth regarding the origin of highway still goes on. Batticaloa -The land of Singing Fish!